Last night the women's chorus I'm in finished its spring season with a fabulous concert; we've never sounded better. Unfortunately, it was our director's last concert -- after 11 years he finally decided he wanted his Sunday evenings back. Our new director is fine, but I don't think anyone will ever be as wonderful as John. I'm relieved the chorus season is over though. Those Sunday evening rehearsals are hard and learning the music is time-consuming. I'll go back in September, of course, because I love it, but now I'm glad to have the extra time. I'm getting things caught up and getting back on track with my book and other projects. 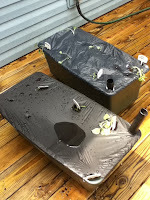 This morning I finally got my two Earth Boxes planted and set out on my new deck: beefsteak tomatoes, cherry tomatoes, a melon, peppers, roma bush beans, and some broccoli for the birdies. All organic. It's nice and hot outside, but we're expecting another big storm later today. The transplants are droopy, but I'm counting on them perking up by tomorrow. Next week I'll put up the staking system that comes with one of the boxes, so the beefsteak tomatoes have something to climb on. I can use plain dowel rods for the other things that need staking. I spent a few days in Arkansas last week with some people I'd met on the internet. There were 11 of us, all parrot slaves. It was nice, and I was glad to meet them in person. My friend Bev lost one of her two cockatiels a couple of months ago; it was sudden and there was nothing she could have done. It sounded like a seizure or stroke to me, but I'm not a vet. Now her other cockatiel just returned home from three days in the hospital; kidney problems and some sort of infection. She's taking good care of him, but I know how hard and heart-wringing it is to see such a wonderful creature sick. I've got my fingers crossed for him and her, too. My backyard is getting overrun with honeysuckle bushes; it's a never-ending battle. Last week I asked the guy who cuts the grass if he'd come over and just dig the damn things up (as much as possible). There's also a horrible spread of poison oak that's climbing up two of my trees and onto the side of the neighbor's house. This morning I looked out the window and noticed that I didn't see any honeysuckle, and that the chair, table, and various pots had been moved next to the deck. I tried to remember if I'd seen it that way yesterday or the day before, but I've been so busy I couldn't recall. I wrote the guy to ask when he'd been over, and he said he hadn't (it's rained nearly every day the past two weeks). So who's been over here, clearing out honeysuckle? I have good neighbors, but I can't imagine them coming over to do such a thing, especially without me knowing. Or maybe I'm hallucinating. Considering all that's been going on this spring, it wouldn't surprise me. 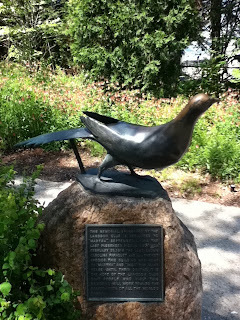 During my recent trip to the zoo I spent a lot of time in a little building that was dedicated to the Carolina Parakeet and to Martha, the last Passenger Pigeon. The building also houses that beautiful Audubon picture of a flock of Carolina Parakeets (you can see that on the included Wikipedia page link), various news clippings about the demise of Martha, and some tasteful displays about extinction. Martha died at the zoo in 1914. Passenger pigeons were the most common birds in the US until we got rid of them. Evidently, it took us awhile. 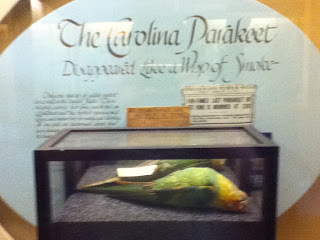 The Carolina Parakeet was the only parrot native to the US. It was displaced and hunted to extinction in the early 1900s. I knew about the species, of course, from my various readings, but I'd never imagined I would get to see a skin. Near the back of the building was the exhibit for the parakeet, and it included a skin. 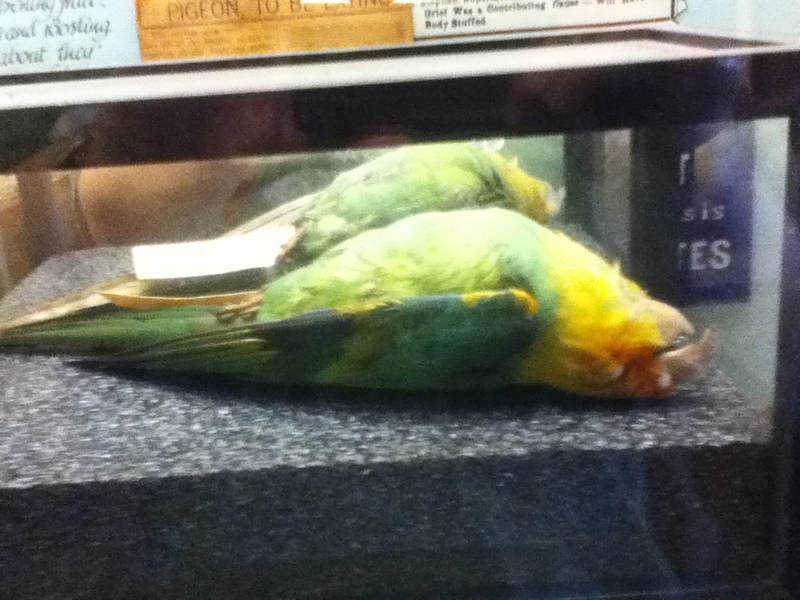 This picture is the best I could do in the dim light and through the display case. I don't know what, if any, effect time has had on the feathers -- I'd always heard the species was brightly colored, but as you can see, the colors are more soft and pastel. The Carolina Parakeet was the only parrot native to the US. It was displaced and hunted to extinction in the early 1900s. I knew about the species, of course, from my various readings, but I'd never imagined I would get to see a skin. Here is the display. Here is as clear a picture as I could get. It was just heartbreaking to look at this. Its beautiful feathers and colors, its compact size -- it wasn't much bigger than Charli. I wonder what its sounds were like, if it would have been as crazy for almonds as the Bobbsey Twins are or as jealous as Charli is. Somehow, if we ever learn to clone from DNA successfully, I suspect parrots will be at the bottom of the list. Even one as beautiful as the Carolina Parakeet. 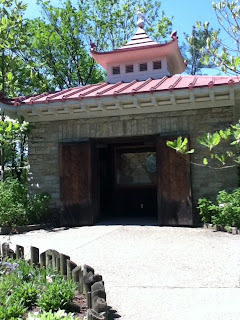 Yesterday I went to the zoo for the first time in several years. I and some friends used to make a trip in early spring to either the zoo or the museum or botanical gardens, but we got out of the habit. It's one of the better zoos in the nation, and we're lucky it's just an hour or so away. Most of the exhibits were as I remembered, but they'd added a lorikeet exhibit and I spent some time there. The staff person who was selling cups of nectar and seed sticks and I chatted about parrots for a few minutes. A harried mom offered me two seed sticks and I bought some nectar. 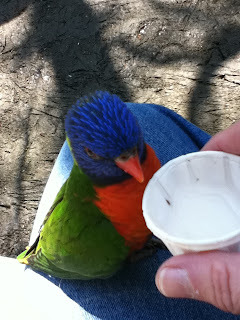 I barely had a chance to give the woman money for the nectar before two or three lorikeets flew over to eat and drink. I loved it, of course. 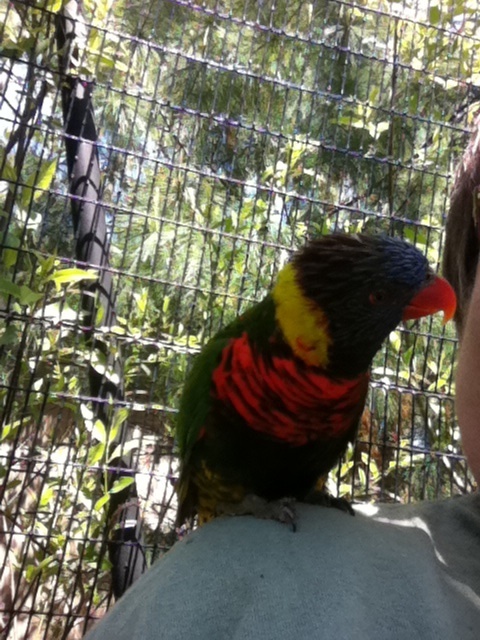 One of the lorikeets casually landed on my shoulder as if she'd been trained. Maybe she had. Of course, they're all comfortable with people and squealing children, but I was surprised at how stubborn some of them were. One of them was on a tree branch just above me. I offered him the nectar cup, and after a slurp or two, he simply yanked it out of my hand, clamped it against the branch with one of his feet, and took his time taking the rest of the nectar. A couple of times I gently tried to pry the paper cup away from him, but no way would he let go of it. The staff woman said the zoo feeds the lorikeets all kinds of fruits and vegetables, that sometimes when she comes in the entire ground of their aviary is covered with lettuce and the lorikeets are going to town on it. There were a couple of lorikeets who looked a bit plucked; the woman said they have had some bully problems. I took a lot of pictures, which I'll post at future dates.